Your optimum charter is downwind from Bodrum to Gocek, for which you ideally need 7- 10 days on a luxury gulet (“goo-let”); or beyond to Kas, Kalkan and to Antalya if you have time for 12 – 14 days. This charter route showcases a nice blend of wide-open spaces, historical sites, towns, villages and restaurants. A 7-day charter will be based on taking you in either a circle itinerary from Bodrum to Bodrum, or along the coast from Bodrum to Marmaris or from Bodrum to Gocek in the Bay of Fethiye, or vice versa. We offer a complimentary planning service to help satisfy your travel desires. 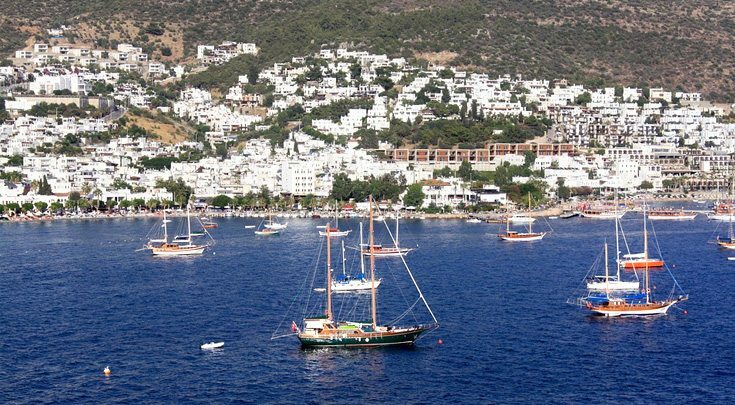 Bodrum to Mersincik – Embark in Bodrum (the boat building capital for Gulets – goo-lets) in the afternoon and sail south to Mersincik, a small cove with crystal-clear waters and one of the prettiest stops along this stretch of the coast. Enjoy dinner on board in Mersincik Harbor. 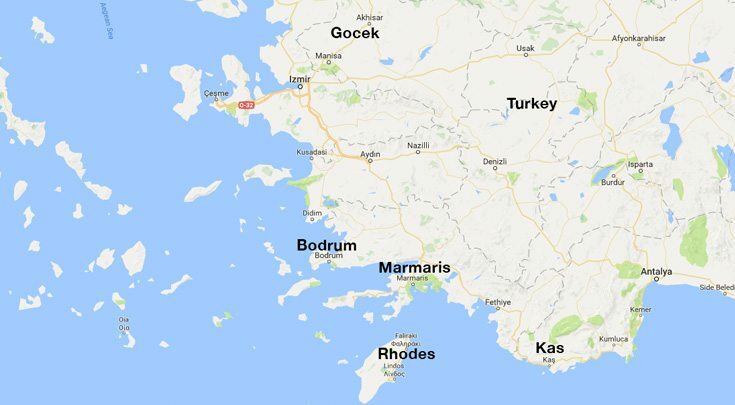 Knidos and Hayit Buku – Rounding the tip of the Datca Peninsula, anchor in the eastern bay at Knidos. After lunch, go ashore and explore the ruins of this ancient Carian city, famous as a centre of art and culture in the fourth century B.C. 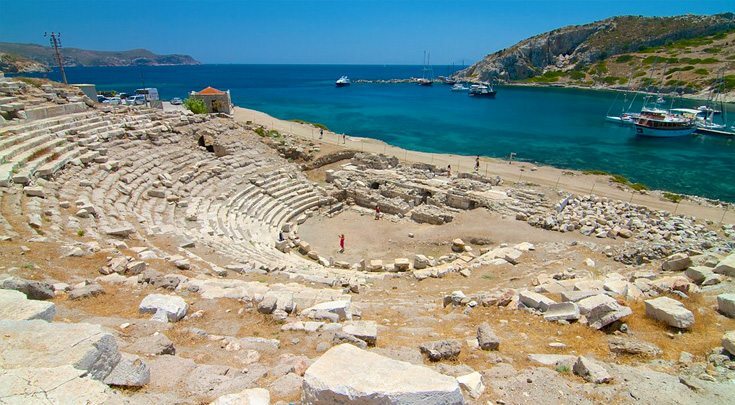 Knidos was once a flourishing trade city and had two theatres, two harbors and a large number of residential homes. Praxiteles’ most famous statue, the Aphrodite of Knidos, was a tourist attraction here and many, many sea travelers would come to Knidos specifically to see it. The remains of this temple are visible today, as are those of the agora, the theatre, an odeum and a temple of Dionysus – among many other interesting buildings and structures. In the late afternoon, move on to Hayit Buku and a chance to walk the shores of this lovely little bay. Hayit Buku, with its backdrop of majestic mountains, is a truly magical place. Swim, snorkel and enjoy some walking around the village. Tonight, dine in typical Turkish style at a local’s “lokanta” – Ogun’s Place has been a favorite for years! 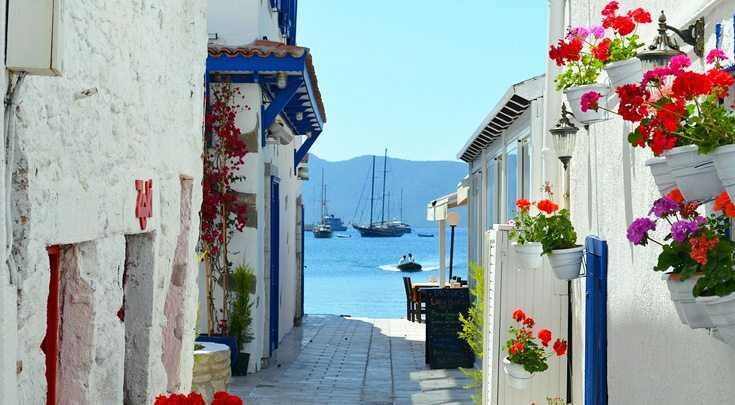 Datka and Selimiye – Today begins with a sail along the eastern side of the Datca Peninsula with perhaps a visit to the town of Datca for sightseeing in old Datca town. 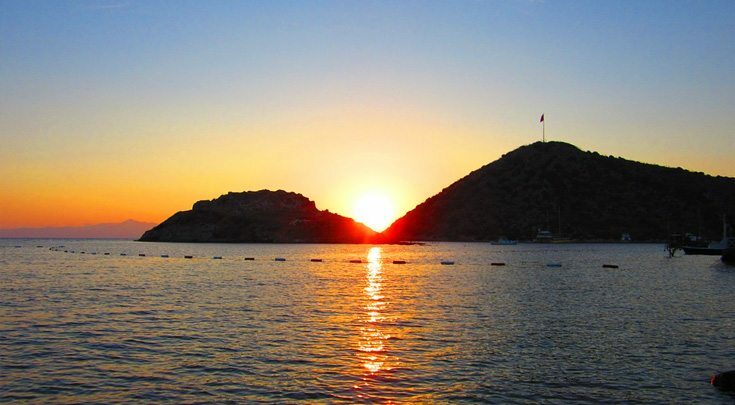 In the afternoon, cruise up the Gulf and into Selimiye, anchoring alongside a small quay, close to the village. Selimiye is a farming and fishing community, situated along the shores of a large bay and offers yet another superb backdrop – this time featuring well-rounded hills that descend through olive groves and almond orchards to the shore. 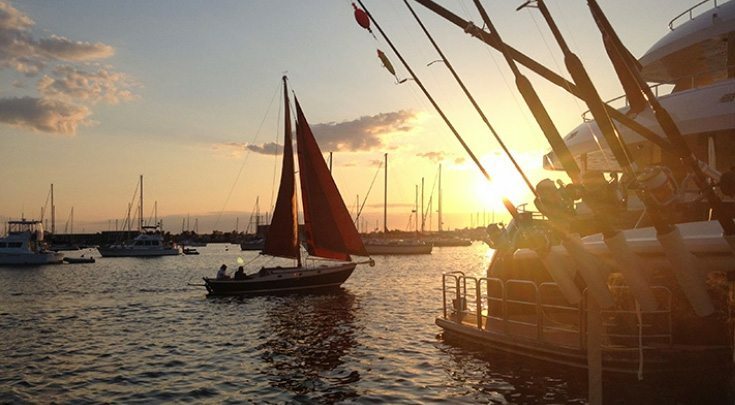 Dine ashore tonight at a nearby fish restaurant serving some of the finest local specialties. 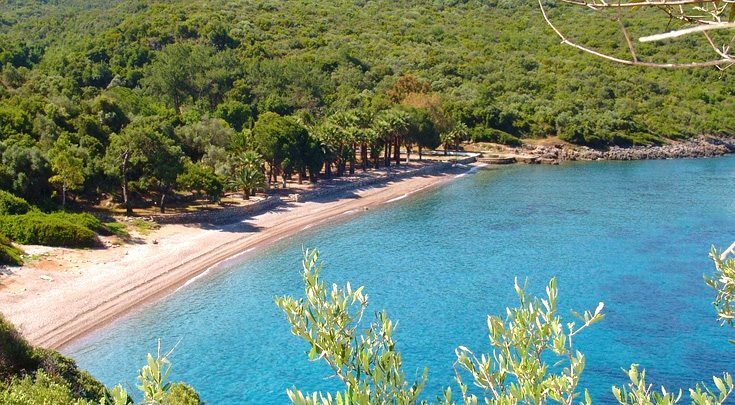 Keci Buku Bay and Dislice Island – Here is your chance to visit the village of Orhaniye, set at the foot of tall, pine-forested mountains. Walk along an isthmus of red sand, stroll through the village or explore the island in the middle of the bay – topped, as it is, by an ancient fort. Spend time in idyllic surroundings before moving on to Dislice Island for the night. Dinner on board anchored off Dislice Island. Dirsek Bozburun – After a leisurely morning of swimming and perhaps some kayaking around the island or in nearby Bencik Bay, cruise for Dirsek and stay for lunch. Bozburun beckons later in the day, and as it is set among islets and inlets, have your camera on the ready to capture your arrival. Bozburun was once the sponge-fishing capital of Turkey but is now regarded as one of the country’s boat-building centers. There will be time to explore this charming little port – with its small selection of shops and cafes – after dinner on board. Bozukkale – From Bozburun, we make the short journey to Bozukkale, and anchor beneath the walls of ancient Loryma’s well-preserved citadel. 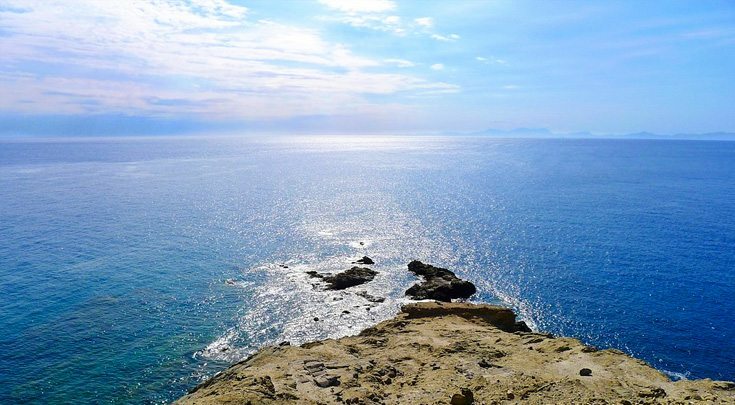 This is an ideal place to enjoy water sports of all kinds and a trip ashore will bring some rewarding discoveries – among them, the fabulous view of the nearby Greek island of Rhodes. Enjoy another excellent meal on board tonight. Serce Harbor and Kadirga – Cruise to Serce Harbor and spend the morning swimming, snorkeling and kayaking. It was here, at Serce Harbor that George Bass discovered the famous Islamic Glass Wreck. Continue on to the pretty anchorage of Kadirga, or, if there are plans for a final night’s party ashore, sail a little further and moor on the quay at Kumlu Buku Yacht Club. The “Yacht Club” has an excellent menu with both local and international dishes on offer and is set among carefully-tended gardens, overlooking a pebbled beach. Marmaris – Enjoy a relaxing departure.